Spain seems to be one of the most underrated nations in Europe. You always hear about your friends running off to France, Italy, Germany, Switzerland, etc, but why is it that you don’t often hear about a friend’s adventures across Spain? Having been to the majority of countries in Europe, I myself have no explanation for why I waited so long to visit this unique nation. Now, having experienced much of what the Spanish have to offer, I can wholeheartedly recommend a trip to Spain. It’s just as romantic as the rest of Europe, but with a very different, almost familiar and comfortable atmosphere that I would equate with the US. The Catalan region of Spain (Catalonia) is, in itself, somewhat different from the rest of Spain. It is regarded as the economic powerhouse of the nation, contributing greatly to the overall GDP, and has a certain artistic flair to it. Barcelona is essentially the symbol of the region and one of the highlights (IMHO) of Spain. One of the most commonly known historical architects of Barcelona is Gaudi, whom had a very unique style to his architecture. Ever wonder where the phrase, “That looks so Gawdy” came from? Despite the phrase often alluding to mismatched colors, bold and clashing designs, the famous architect Gaudi manages to make these themes work. While his name is not the origin of the word, it is somewhat of a pun these days. Sagrada Familia is his most famous work: a basilica that exhibits his style both inside and out. At first glance, it’s just odd. As you examine closer, you’ll start asking yourself, “Are those corn cobs at the top of the spires?” Indeed they are, as the entire basilica is modeled after nature and earth. Hopefully you’ve already arranged your admission to this basilica, because attempting to get tickets the day of usually results in not gaining admission until very late at night. Before you leave the city to head to Guell park (see below), you should spend an hour or two just wandering around the Gothic Quarter. If this isn’t your first time in Europe, you’re probably already familiar with the Gothic style of architecture. Spain is no exception here, and it’s always a pleasure to be transported back to this era in a district that has several city blocks of structures dating back to that era. Shops and cafes line the streets, so don’t focus only on the bold architecture - take a minute to notice what the people of Spain have to offer by way of clothing, cappuccinos, toys, souvenirs, etc. Once you’ve experienced the bustling aspect of Barcelona, you should consider another Gaudi masterpiece: Guell park. Originally funded as an upscale neighborhood, after funding fell through it was converted to a park for the public. Gaudi’s themes run through the entire landscape, and you’ll need tickets in advance as well to gain entry to the main area. Save yourself a few hours to experience all of this - if you don’t have the time, just check out the park and don’t worry about paying for admission to the center. Now that you’ve come to the end of your jam-packed day in Barcelona, you’ll want to get over to the Magic Fountain. The hours vary based on the season; in September the show started at 9:30 PM. Grab a bottle of Cava (champagne) at one of the sidestands and grab a seat on the stairs. The show seemed to last about 30 minutes and had a couple different “Acts” with the fountain dancing to the music in varying colors. This is an awesome experience and a great way to wrap up Barcelona! You can expect to grab photos like this if you get to Montserrat before the sun comes up. It's more than worth the little bit of sleep you'll sacrifice. If you’re already jetlagged and have begun your Spain adventure in Barcelona, you should have no qualms about waking up super early to head to Montserrat in order to witness one of the most beautiful sunrises you’ll ever see. Montserrat is a famous monastery just outside of Barcelona that is a pilgrimage for some (if hiking by foot) but can just as easily be reached via car. It’s a very popular tourist site, so I advise getting there before the crowds. Honestly, the #1 reason, in my mind, is to watch the sunrise. Sacrifice the sleep; it’s totally worth it. When we arrived, I think we saw maybe 3 other people. We grabbed the first lookout we came across (as seen in the video) though there are plenty more you can find if you continue to walk and explore. Around 8 AM, you’ll the whole atmosphere changes from this serene and peaceful mountaintop place of worship to practically Disneyworld. Hundreds, if not thousands, of tourists will be crowding the area with selfie sticks and the magic is pretty much gone. At this point, you’ve probably already toured the sanctuary and visited the Black Madonna. You should be about ready to leave as the last tourist bus pulls in to unload its occupants. My favorite destination in Spain! Really, this is a small town with a ton of character. The fort/castle on the towering rock outcropping overlooks the sea and the mountains and is an extremely easy stroll to the top (though there is a little tram you can hop on, but why on earth would you do that?) At the top, there is a small cafe - truly perfect for (another) bottle of Cava with friends. Don’t take the same path down - instead, you should wind through the portion of the town that remains within the fort’s walls. There is an outstanding photo opportunity that I’ll explain in the Protips section below that involves a bit of fence hopping, scrambling, and ducking through holes in the wall to set it all up. There are multiple places to visit in the Rioja region, (we stayed in Logrono) but the main point is that you make the trek and see the pride of Spain’s wine country. You should set up a tour of a winery before you arrive in Spain. I can’t recommend Contino Winery enough; it is exactly what I pictured for an old romantic winery. Every detail was traditional and the tour guide spoke perfect English and was extremely warm/friendly to all of us. We toured other wineries as well, but they seemed to be cutting edge and modern, just as I’ve seen in Napa Valley, with an attempt to include the traditional style that has faded over time. Contino, on the other hand, seemed to transport us back in time. The name itself comes from the word “continual” due to a Spanish soldier that protected the estate and its family for his entire life, eventually earning an everlasting legacy when the winery was named. A couple fun facts: by Spanish law, wine produced must be ready to drink when you purchase it. What does this mean? It means the wineries have aged it in the barrel and bottle for years before it reaches your hands. In Napa valley, you may buy a bottle and are told to age it for a few years before enjoying it; this is not the method in Spain - they believe you intend to drink your wine (I’m of agreement here). Also, there are wineries that throw out entire vintages if they get less than a perfect 100 score on the wine. They literally decide not to distribute *any* wine rather than an inferior vintage of, say, 99% perfection. This means the staff/owners/associates end up enjoying that year’s production themselves, or they sell it off to vineyards that would only dream of getting a 99% score. This seaside city is one of the most popular vacation and cultural destinations in Spain. It’s situated on the northern coast and, in some ways, is similar to Tossa de Mar, but with the volume turned all the way up. It is sometimes referred to as the Rio de Janeiro of Spain due to the statue of Christ overlooking the city. Don’t be surprised if there is some sort of cultural event taking place (the international film festival while we were there) as the city has a large convention center. There is much to do, but we chose to just stroll the streets and enjoy the plazas. There is a large beach that is easily walkable from most parts of the city and plenty of dining options. This town is worth visiting because of the enormous cathedral and the castle Alcazar. It’s likeness is that of something from Cinderalla and tickets can be purchased to tour throughout the inside. However, the secret I want to offer to you here is another awesome photo opportunity. When you’re around the castle, there will be throngs of tourists that will absolutely find their way in your photo from pretty much every angle. However, we found a location that was deserted in the evening with the sunset lit castle in the background. Scroll down to the Protips section for the exact details. This is an example of a photo you can grab on the way up a lesser known photo spot in Segovia. Don’t ask me how to pronounce this monastery. That’s not important. What *is* important is the fact that this is the filming location of Dragonstone in Game of Thrones. Trust me, it does not disappoint in person. It is west of San Sebastian and takes a bit of hiking to reach after you’ve parked. If you want the steep route (not recommended if it’s been raining), you can get to the first step that leads up in about 15 minutes. Otherwise, you’ll be taking a gradual ramp that winds down and takes about 30-40 minutes. The monastery has served many roles throughout history, especially as a defensive point to hold off pirate attacks or attacks against the crown. Notice in the first and last step that there is a footprint (there is also one at the gates of the city). If you place your foot in the first and last, you’re guaranteed not to have blisters the whole year. Also, when you reach the monastery, ring the bell three times and make a wish (this isn’t a secret, everyone is doing it and the bell pretty much rings constantly, but it’s a nice ambiance to the whole scene). These two are basically photo/selfie oriented, but I think they are pretty valuable for grabbing that awesome shot that friends will notice. First, when in Segovia, you're going to want a photo with the Alcazar castle without hundreds of tourists in it, right? Of course you do! 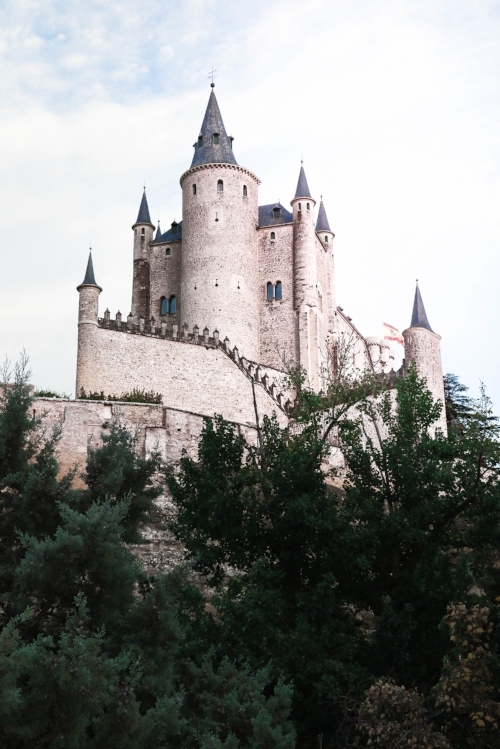 Go ahead and tour the castle just like everyone else, but when you've finished/grabbed a bite to eat, I recommend you find a bottle of cava and head to the location I've pinned on the google map here. You'll park on the side of the street at what appears to be a small park, but there is a path (somewhat steep) that leads up the hill just off to the right. Start your hike and you'll find a little photo nook with a rail for safety. Hopefully you're arriving just before sunset, so you can enjoy the cava and wait for the crowds to clear off the castle (it closes down, so just enjoy the sunset until your perfect photo opportunity is ready). Notice on the Gmap that there is a photo icon exactly west of the castle. This does serve as a nice photo opportunity, but the spot I'm referencing is on the steep path that winds up the hill before you get to that spot. It actually is marked on Gmaps with a whopping 1 review (so it's still pretty unknown). Why not grab a photo from both spots? Second, when you are in Tossa de Mar, you'll want to get a photo of a friend on an epic cliff overlooking a cove of super blue Mediterranean sea. In the video, you see me scrambling/hopping over a fence near some stairs - that's where your friend should position themselves (there are pieces of rebar in the ground to grab for safety). The photographer should keep heading down these stairs until you run into some structures. Head left through the hole in the wall and look up at your friend! When looking at this Gmap, you can see the curving stairway on the edge of the cliff, it's only 20 feet or so off the path. Keep your eyes open and you'll see it (or take a look at the video again, we tried to make it pretty obvious). One more tip for you: if you are finished seeing the sights and attractions of Madrid and just want a place to sleep before your flight in the morning, I can recommend Hotel Don Luis for two reasons. First, it was only about $50 for the night, and it's a very basic hotel that was safe and clean. Second, instead of worrying about organizing a taxi for your early flight, you can simply walk to the airport. If you look at the map I've embedded, you'll see there is a pedestrian bridge that crosses the highway towards the airport (about 2 blocks from the hotel). I awoke at 5 AM and walked in the darkness to the airport (my first time ever walking to any airport) and felt perfectly safe and was pretty smug as well for saving the cab fare and being on my own schedule. It's about a 15-20 minute walk.